Often when looking at these walls I am appalled by their quality, the climbing is great as you weave yourself in and out of what appears at time to be a giant wormery. Climbs the wall left of Hysteresis. Start below the left most part of the wall, below some green balls of ‘Mosscampion’. 1 27m. 6a. Climb up left of the balls and over a roof to belay on the same ledge, but further left than Hysteresis, on some spikes (hanging off the ledge). 2 40m. 6a. Climb straight up on excellent red rock, through a bulge, to a ledge. Climb over the break/roof to the next break/roof. Move up and right to join Hysteresisas it passes through the blank rock. 3 15m. 4c. Hysteresis, p3. Mike Twid Turner and Louise Thomas, 1997. Climbs the left side of the Hysteresis wall finishing up the hanging face in the top left corner of the zawn. 1 37m 5c. Hysteresis p1. 2 35m 5c Traverse left for 8m then climb the compact red wall to a break. Pull past a bulge on the left then climb trending rightwards on gritty rock to a blunt rib leading to the slanting turf break below the headwall. Belays in short vertical crack over on the left. 3 25m 6a Climb up and over the roof above the belay and continue past a second overhang before heading leftwards across the wall to top out via the obvious groove. Pat Littlejohn and D Garner, 13/12/01. Adding p3 of A Winter’s Tail to Two Fat Slabs makes for a long & sustained hard route. Two brilliant pitches up the centre of the attractive golden wall, strenuous and sustained. The route is prone to some seepage and is a bit messy at the start of the season, being a fashionable social scene for birds (feathered). Start in the middle of the wall, at a ledge about 6m above the sea. 1 37m. 5c. Climb easily up the wall for 6m and go over a slight bulge to a reddish band. Go through this to a horizontal break, then climb rightwards until the higher break can be gained. Move back left to a crack in the roof, poor peg. Fluster over the roof and quickly layback up to a good ledge and belay. 2 37m. 5c. Slightly harder climbing up leftwards now gains the large obvious niche. Weave up the wall heading for the sentry-box and boldly exit it onto the slab. Continue carefully up the wall, and go slightly left to a peg belay in a chimney. 3 15m. 4c. Climb the unprotected arête to belays well back. LE Holliwell, B Whybrow (3 pts) 31/10/71. FFA LE Holliwell 1971. The narrow face between Hysteresis and Primate/Final Front-Ear. An eliminate but with good bold climbing on solid rock. Shares the first 20m with Final Front-Ear. 1 40m 6a Follow Primate towards the arête then go straight up a cracked wall 3m left of the arête to a break. Climb leftwards through an area of steep contorted rock to the base of a smooth orange wall (Friend 4 in keyhole slot). Pull on to the wall and make a committing sequence leftwards and up to the belay of Hysteresis. 2 50m 5c Move 4m right and up to a good spike, break through a niche on to the wall and climb via the obvious groove to a break. Swing right then up past some strange slots to an open face which is climbed to more rugged ground leading to the apex of the wall. Pat Littlejohn and D Garner, 14/12/01. A challenging enterprise up the wall right of Hysteresis. 1 35m. 6b. First take thin cracks, 5 metres right of Hysteresis to the big breaks. Now thrust up the overhanging jugs, with little protection, and cling on to place a Hex 11 in the lip. Step up the warp factor and traverse right on little holds, crux, to reach the ‘ear’. Easier climbing leads to the belay, on Primate. A challenging enterprise. 2 35m. 5c. Follow a hand crack through the overhang and up the wall to a good thread. Move left on amazing pockets then go up and rightwards to join Primate to finish. Paul Prichard and Gwion Hughes, 14/8/97. Steep climbing with not much protection, followed by easier climbing with less, but all in a fine position on the right arête of the Hysteresis wall. Start as for Hysteresis, at the ledge in the middle of the wall. 1 34m. 5b. Climb to the arête, up a short wall to reach a ledge, then swing around the arête into an overhanging groove, and ascend this to a peg stump. Make some blind moves left around the arête, easing quickly once on the front face, and go up to a small ledge. Climb a groove for five metres to belay on a pinnacle. A very fine pitch. A more solid variant is to climb the obvious face cracks 3m left of the arete at 5c and then traverse right to the small ledge. 2 25m. 4c. Go up the obvious weakness to the ledge on the right side of the arête, then climb the wall three metres right of the arête. 3 37m. 4c. Climb straight to the top on the left-hand side of the arête. Joe Brown and Ian G McNaught-Davis, 13/5/67. Starting from sea level, an extremely overhanging thin wall lives beneath the pleasantries of Primate. Big moves on snappy holds, relying on old pegs for protection, make this a real attraction! Start on a tidal ledge, beneath a gigantic chockstone. Climb the left-hand side of the chockstone and swing onto the steep wall on the left, often wet. A peculiar move up brings large holds and two peg runners within reach. Race up the steep wall to reach Primate on the arête. From here, most of the previous routes can be tracked. An exciting but unpopular route, due to poor rock. Start at the right-hand end of the overhangs in the corner of the zawn. 1 30m. 4c. Climb the slab at its easiest point to a groove on the left of the huge Green Slab. Go up the broken groove to belay below a small roof. 2 25m. 4c. Climb the groove, and go up easier rock until a small stance is reached. 3 25m. 4c. Climb the groove until it eases, and curves right. 4 12m. 4c. Go over the roof on the left, and finish easily up a groove. Pete Crew and Geoff Birtles (AL), 22/10/66. Good open climbing up the huge slab in the centre of the zawn, but it should not be approached carelessly; this is a very serious route, runners and belays are scarce and the top out is death on a stick. Take plenty of long slings. Start to the right of Primevil, below a large groove defining the lower right-hand part of the slab. 1 23m. 4b. Climb the left wall of the groove, trending left to an obvious break on the arête. Thread belay just left of the arête. 2 23m. 4b. Climb the crack above diagonally left into the corner, and go up to belay, as for Primevil, below a small roof. 3 30m. 4b. Move onto the slab, and take the easiest line up and right to a small stance. 4 30m. 4b. Climb the short wall above into the long diagonal breach, then follow this leftwards to the top, with a generous pinch of exposure. The transition from rock to dirt (with no change of angle) will be the most worrying section of the route for many: keep going in the same line as the breach. Stan Wroe, Dave Crilly, Paul Braithwaite 5/6/65.This was the first route climbed at South Stack. An impressive and hostile line, cunningly working it’s way through some unreliable territory in the middle of the zawn. Start six metres to the left of Mousetrap, at the foot of a groove leading to an overhang at 12 metres. An easy ride for the second! 1 25m. 4c. Ascend to a ledge level with an overhang on the left, and climb under this to a groove. Follow this to an awkward belay where it steepens and becomes difficult. 2 30m. 5c. Climb the right-hand wall above trending to the arête which is followed to a peg beneath some overhangs. Reluctantly traverse right for five metres, only lured on by the welcome ledge in no man’s land. Carefully leave the ledge trending slightly right, peg, until a traverse line beneath overhangs leads leftwards via a flake edge to the right-hand side of The Green Slab. 3 30m. 4b. Follow the edge of the slab to belay at it’s top. 4 15m. 5a. Surmount a bulge, and go right over another bulge into a groove. Mick Fowler and Anthony Saunders (AL) 9/9/84. Helmet Boiler. Photo from Tim Neill Guiding. A left to right diagonal route across the whole of the Mousetrap Zawn. 1. 5b.Climb the crack direct up the front of the Wedge to the Helmet Boiler belay. Left of Helmet Boiler first pitch. 2. 40m.6a. Climb over a bulge above the belay and traverse a break right below the Helmut Boiler to a corner. Difficult moves rightwards across a steep wall brings a belay on Death Trap. Sandy runners! 3. 45m. 6b. Climb Death Trap for 30 feet to a bulge and traverse around a nose to a steep wall. Tricky moves bring easier ground which leads to Mantrap belay. Dai made horizontal lunges and wailing sounds on the lead, I wondered about seconding the pitch or not! 4. Start up a crack (right of Another Roadside Attraction) and after 20ft wander up right to the top right hand side of the zawn. Head for the Vaynol at top speed! 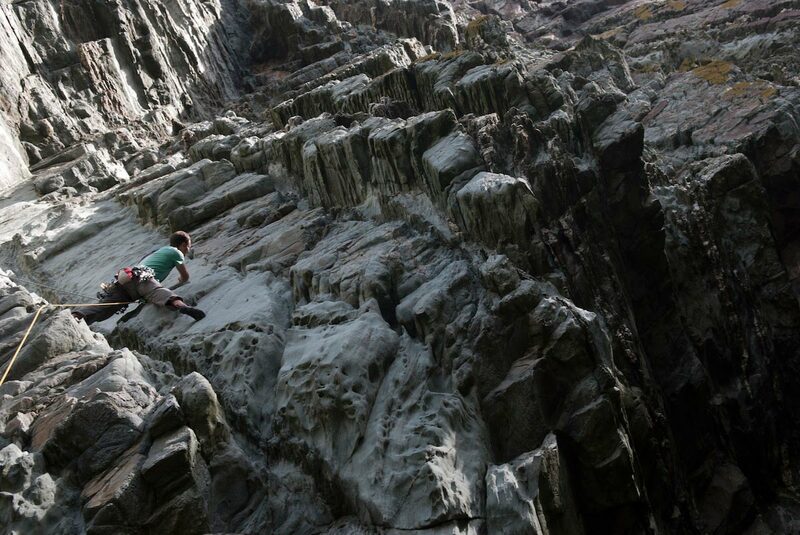 Visually and mentally stunning, this route sums up everything that is best about British sea cliff climbing. The outcome is in doubt until the final moves. There’s a distinct sense of loneliness in this zawn. Easy for the grade and nowhere technical, but very imposing. Care is needed to protect both leader and second alike. Start by the left of two grooves, left of a large sea cave. The groove leads to a pillar, which is left of a huge grey corner. 1 45m. 5a. Climb the groove and go up to the top of the pillar. Move down and right, beneath a large corner, to below the corrugated flutings/chimneys. This point can be gained direct up the groove below. Enter the chimney via a difficult move and pull round the rib immediately to the next. One can continue up the first chimney, but this is harder. Continue up to easier ground and a slab. This easy slab is crossed rightwards to belay on a good ledge at its end. 2 46m. 5a. Carefully climb the wall above, a bit mystifying at first, to reach a slanting groove. Worrying moves entering this are followed by a much more casual plod up the green ramp in a fine position. Continue passed a peg to a belay just below the top of the ramp. 3 37m. 5a. Step right out of the niche above onto the red wall, with a difficult section to gain a groove on the right. Go more easily to the top. Joe Brown and Peter Crew, 9/10/66 (2 pts aid). A very impressive and serious route based on the obvious striking central slanting chimney of the Zawn. Superseded by the direct variations. Start from the right hand-side of the zawn, almost level with the big stance on Mousetrap. Warthog pegs are recommended for pitch 1, as well as a large rack of cams and slings. 1 14m 5b. Worryingly scramble up the muddy pillar to the right of the large sea cave, moving up and leftwards to a grass ledge, roughly level with the Mousetrapbelay. Continue left across the muddy break until it is possible to make a slightly descending traverse to belay, as for Mousetrap. 2 12m 4a. Move easily across the big slab, step round an arête, and go up for five metres to a poor belay. 3 40m 5b. Go out right to the left edge of the main slanting chimney. Follow the chimney until it steepens then climb up straight up to enter an easier corner, which leads into Mousetrap. Follow this to the top of the slab. 4 12m 5a. Helmet Boiler p4. Mick Fowler and A.Baker, 7 Aug 1982. 1 20m 5c. This gains the main slanting chimney at the earliest available moment. Start by the right-hand side of the sea cave. Climb up right of the cave to a ledge on the left, level with the lip of the cave. Arrange warthog protection and make a long and committing span left onto the wall and left again to gain the main diagonal line. Climb up this to the Mousetrap belay. 2 45m 5c. An awesome and logical direct on the original. One of the finest pitches at Gogarth. From the stance on Mousetrap, climb straight up the slanting chimney past a worrying steepening, to regain the original line. 3 12m 5a. Helmet Boiler p4. p1 Will Perrin and Pete Robins, 2003 p2 Crispin Waddy and Gwion Hughes, 3 Sep 1988. 1 5b. Climb the wall right of Mousetrap pitch one. Traverse right as for The Head Strimmer and traverse 20ft further. Continue up a grove to the belay of Mantrap. 2 6a. Climb the wall left of Mantrap over a bulge to a ledge. A good pitch. 3 5b. Climb the wall right of The Head Strimmer up hidden pockets on excellent rock to the top. Mike Twid Turner and Louise Thomas, 2000. 1.45m. 5b. As for Mousetrap, pitch 1. 2.10m. 5b. From the ledge, climb diagonally right for 8 metres to a volcano, clove hitch. Step right onto a red wall and climb directly to the sloping ledge belay, on Mantrap. 3. 30m. 6a. This pitch unfolds in the area between Mantrap and Another Roadside Attraction. Leave the ledge, climbing the flake above through two stepped roofs and into the right facing groove, joining Another Roadside Attraction. Belay on the left. Dave Towse, Adam Wainwright (AL,1997). Second ascent Mike Twid Turner and Louise Thomas, 2000. A very good route centred on a short sandy chimney, hidden (from some view points), in the middle of the red wall. The first pitch is very serious. Start from sea level, right of the large cave. 1 50m. 4c. Carefully work up the tottering pillar to the right of the muddy break, right of the large sea cave, for about 30 metres. Arrange decent protection on the right, then cross the muddy section to gain the wall proper. Follow a ramp into a short corner and belay on a sloping ledge above. 2 30m. 5b. From the left-hand end of the ledge, climb diagonally left and over a bulge, heading for the obvious overhanging chimney. Shuffle up this to gain the red wall above then move right until it is possible to climb straight up. Belay on the right. 3 20m. 5b. Traverse right for three metres, then pull up and left over a bulge and follow a weakness rightwards onto easier ground. P1 LE Holliwell, LR Holliwell May 17 P2+3 LE Holliwell RJ Isherwood May 26 (1969) 1 pt aid. A fine route with an excellent, but tiring, main pitch up the red wall on the right side of the zawn. Start from sea level, right of the large cave. 1 50m 4c. As for Mantrap, pitch 1. A very serious pitch. 2 30m 6a. From the right side of the ledge, go rightwards, then up on awkward holds to gain a shallow left-facing corner and overhang above. Strenuously pull onto the smooth wall above and continue up, heading for the stance on Mantrap. 3 21m. 5b. Climb above the belay for three metres, then move left to a slight right-facing corner. Ascend this and the wall above. G.Tinnings, P.Trower 3/8/80 (1pt aid). FFA Stevie Haston 1980s. A good, bold route, taking a line through the poor rock on the right side of the zawn. Start from sea level, right of the large cave. 1 50m. 4c. As for Mantrap, pitch 1. Carefully work up the tottering pillar to the right of the muddy break, right of the large sea cave, for about 30 metres. Arrange decent protection on the right, then cross the muddy section to gain the wall proper. Follow a ramp into a short corner and belay on a sloping ledge above. A very serious pitch. 2 23m. 5b. From the right side of the ledge, go rightwards across the red wall to reach grey rock on the edge of a pillar. Climb up a shallow chimney, peg, to belays below a curving crack. 3 23m. 5a. Ascend the crack for a couple of metres, then step right and climb the steep broken groove. Joe Brown and Peter Crew, AL 14 Oct 1966. The loose wet chimney right of Bedlam. 1 40m 5a. Climb the chimney. 2 21m 4b. Keep going. LE Holliwell, M.Howells AL 23 May 1969. M Howells, JM Kosterlitz, May 1968. P1 climbed by J Brown, BA Fuller earlier in 1968. LE Holliwell, B Whybrow 5 Dec 1971.